GrowGood is a recognized charitable organization by Amazon! For those of you who don’t know, AmazonSmile is a website operated by Amazon that lets customers enjoy the same wide selection of products, low prices, and convenient shopping features as on Amazon.com. The difference is that when customers shop on AmazonSmile (smile.amazon.com), the AmazonSmile Foundation will donate 0.5% of the price of eligible purchases to the charitable organizations selected by customers. This Black Friday, score deals through GrowGood’s AmazonSmile Profile smile.amazon.com/ch/45-5472840 and AmazonSmile donates to GrowGood. On Thursday, November 15, 2018 at the UCLA Covel Commons, Andrew Hunt, GrowGood co-founder and UCLA Anderson alumni, represented the organization as part of the Profit Meets Purpose: How LA Businesses are Making Money and Making a Difference seminar. Check out the the great profile of Andrew here. He’s handsome, with a smattering of moles that dance across his nose. His hair is always perfectly slicked back, and his smile spreads fast and wide. He often can be seen working at the Bell Shelter, or chatting with friends outside under a jacaranda tree. Keith Burston is a dapper man. If appearances are any guide, the surprise about Burston isn’t that he grew up in the world of Motown in his Detroit neighborhood, a nephew of the great Smokey Robinson. The aching surprise is that he ended up an addict who lived for years on the street. Things, he says, are changing for him. “I’m ready to stay clean, move ahead with my life,” Burston says. Burston, 58, is always articulate about his feelings. When he worked at GrowGood farm in the Transitional Employment Program, he often compared his work to his life, talking about the miracle of growth or the value of being outside. “Keith has incredible sincerity and a sly sense of humor, as well as deep thoughtfulness. He would always surprise me with inspiring and heartfelt insights at our weekly meetings, connecting his journey through life with the rest of the natural world he saw on the farm,” says Katie Lewis, the farm manager. “At one point I said I would buy a ticket for his speaking tour, and I mean it! I also enjoy Keith's songs, which he would sing while he worked--lots of Motown, obviously,” she says. “I was at my lowest point, but my highest point in terms of surrender,” Burston says. He’s also become attached to God. “I always kept the Lord in mind, but I was afraid to praise God. I didn’t feel worthy. I didn’t feel worthy of anything,” he says. He also spends time working on his music, often with his brother Darrell Littlejohn, a father of 11 and a four-time cancer survivor who lives in Pasadena. In 1973 they came together to Los Angeles, with a music dream. The pair still perform sometimes for a Sunday brunch. And Burston is working to make a documentary film of his life. Burston’s mother died when he was just 10, and the youngest of 10 children. His sister, Gerry, moved in with her family to help raise the boy. It was his mother’s brother who became famous as Smokey Robinson, and they – along with Aretha Franklin – all lived in a music-soaked neighborhood of Detroit. “People on this side of the street did music. Cats on that side of the street did murder,” is how Burston describes it. Over the years, Burston worked at various jobs, from Direct TV to a printing shop. Another thing he needs? “I need to stay around people who know me. Because isolation is one of the things. There’s nothing like being a room with a lot of people and feeling alone,” he says. Now he marvels at how bad things got: On 9-11 he was out getting high; he didn’t know the World Trade Center attack had happened. And there are sadnesses: He has a daughter – “she was Daddy’s girl” -- he has not talked to in a decade. And he doesn’t know his teenage grandchildren. So how does GrowGood help? “What does gardening have to do with recovery? I couldn’t figure that out for months,” Burston says. But over time, the mindfulness exercises in Jayne Torres’ Food for Life program, spending time in nature, working on growing food all began to make sense. He loved seeing seeds he planted grow. Rohlf, one of a dozen Americorps volunteers who spent time on the farm in the fall, says it was working to make compost that made that so apparent. In the three months that GrowGood’s first group of Americorps volunteers worked, they spent a lot of time rescuing produce from the nearby agency Help the Children. The volunteers took fruit and vegetables that otherwise would go to landfills and used that to build compost piles on the farm. In January, GrowGood’s second Americorps cohort began work. Americorps can be likened to a domestic Peace Corps in which people ages 18 to 24 work for most of year at sites that need them. 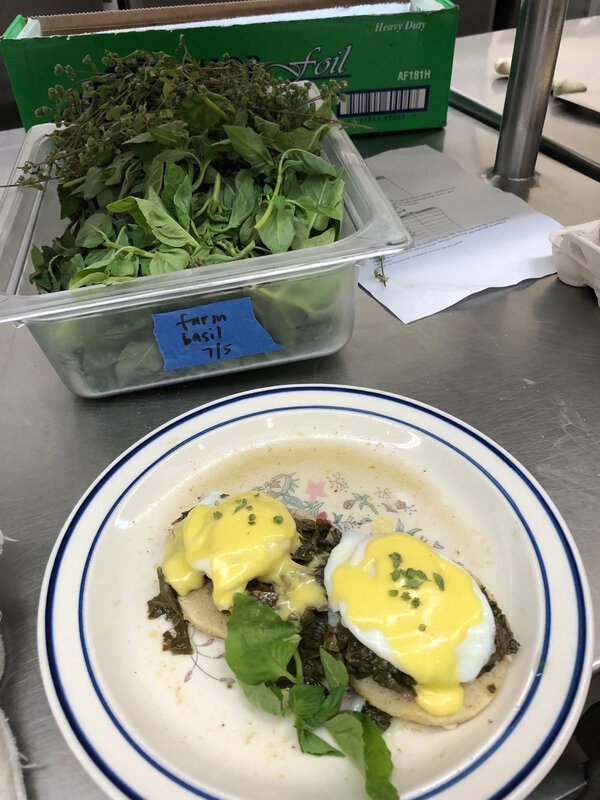 The young people at GrowGood also work at the Bell Shelter kitchen and warehouse; the first group also was deployed to Ventura to help firefighters and people evacuated from their homes because of wildfires. The Bell Shelter applied to be an Americorps site in part to increase the Salvation Army’s emergency resources, which are based there, says Nick Nguyen, the emergency disaster services and service extension director. Anyone walking through the gate at the farm can see the compost operation immediately on the left. Along with food scraps, compost piles are made with mulch donated by tree trimmers and leaves and plant scraps from the farm. Any scent from the piles generally is the pleasant smell of the tree mulch. In addition to the compost, the volunteers got experience at various farm jobs. Read Kristin Marguerite Doige's wonderful story about how Dillion Toscano worked his recovery around GrowGood in Caring Magazine. Thank you Kristin and Caring Magazine for highlighting Dillion's inspirational story! When I came to the Salvation Army's Bell Shelter in December, it seemed like a nightmare had brought me there. I was out of a job with no home, very little money and no support from my family. For the first few months I concentrated on my skills in computer graphics.Then in April, I applied for a three-month employment program at GrowGood, a sustainable farm that provides healthful food for the shelter and is just a stone’s throw away. I thought this would be a good opportunity to earn some money while I continued my computer graphics studies. I soon learned that working at GrowGood was going to be much more than just a job. The work was harder than I imagined, and at the end of every day I felt it. But each day it also left me with a sense of satisfaction, knowing that my labor was helping to put chemical-free, nutritious food on the plates of the homeless. The GrowGood employment program also includes sessions conducted by Jayne Torres, the GrowGood program cultivator. Once a week we explored conflict resolution, personal strengths and weakness, keys to gainful employment and meditation. We talked about how we saw our futures and our ideal jobs. And it made me think of how I saw the world as a child. I thought that if I got involved in helping the environment, maybe I could help stop all the polluting and that could help bring people together. As with most of us, as we grow older we forget about the things that seemed so important as children. As I grew I became more concerned about what others thought of me and less concerned about what was in my heart. Thinking about your past inevitably makes you think of your present. My address was nothing to brag about, but it was warm (sometimes too warm) and dry, and I had a part-time job that, while it didn't pay much, I didn't have many expenses either, and it sure was rewarding. And looking closer at my job, it was directly contributing to helping the environment. Sure, going out and sweating in the little GrowGood farm might be a small step, but it was a positive one. And I have to thank Corrine McAndrews, the farm manager, who in her words and deeds, reminds me every day of something we all know deep in our heart, that if everyone contributes just a little, the sum will be huge. With all that in mind, I began to see my situation for what it was, a chance to do what I had wanted to do for so long. I stopped looking at my job as a temporary way to earn some spending money and began looking at it as a stepping stone to a career. I believe with this attitude my work improved and was noticed, because soon after Corrine told me that I was going to kept on after my three-month program. I was ecstatic. And shortly after that, Jayne told me that an organization called Community Healing Gardens was looking for someone to work at the garden at Markham Middle School in Watts. With Jayne's recommendation and all that I had learned at GrowGood, I headed to the job interview with confidence, and nailed it. Now I work at both places, and I feel my new career is well underway. GrowGood has several projects in the works such as a community composting project and a new greenhouse, and Markham is working on a partnership with an organization called L.A. Kitchen to offer cooking classes to the parents at the school. So the rocky road of a nightmare that landed me at the Bell Shelter has evolved into a wonderful journey. Even though it is still in its nascent stages, I have a new career. We are proud to announce that GrowGood's greenhouse is UP! While she still needs to be connected to water and power, we expect it to be up and running by the end of 2017. Joe Cobarrubio didn’t work at GrowGood farm, but GrowGood worked on him when he lived at the Salvation Army Bell shelter. Cobarrubio says that shortly after he arrived at the shelter from UCLA Harbor Hospital, in August 2016, he happened upon GrowGood – which, although it’s just across the parking lot from the shelter can be a little hidden. He noticed trees and people and came through the fence. Cobarrubio , now 63, came with his hand in a bandage, and left “with a big smile” after farmer Corinne McAndrews told him he was welcome anytime. McAndrews remembers the encounter, too. “I saw a man coming towards me, from out of the field and the drainage basin, carrying a bushel of wildflowers. He was bandaged up pretty well, as he had recently been admitted to the healthcare part of the shelter with a rare flesh-eating bacteria,” she recalls. Cobarrubio, courteous and kind and smart, became well-known at the farm for his artistry with found branches that he turned into elegant walking sticks that plenty of people who show up at GrowGood now use. “I’m an artist at heart,” says Cobarrubio, who has a smattering of freckles and a Fu Manchu-style moustache. Already retired from a career in construction, he started making the canes to keep busy and to restore the strength to hands and arms. And the tools he needed were not allowed in the shelter. So the picnic tables at GrowGood became his workshop. And for everyone else, Cobarrubio’s presence became a source of joy and interesting conversation. That includes Daryl, McAndrew’s dog who happily joined Cobarrubio on walks and sat at his feet. He often brought his lunch to the garden and stayed the afternoon. He vowed that he “was not going back to where I was living and what made me homeless.” Before the hospital, he had a rough run. He lost his right index finger in an accident working on his mother’s house and then his hand was smashed in another mishap. He had no feeling in the hand and finally ended up in am ambulance. But it turned out that his real health scare turned out to be a flesh-eating disease on his side; it put him into a coma, prompted the loss of 80 pounds and left a dramatic scar. “The doctor told me, ‘You are the luckiest man I’ve seen. The person who called 911 saved your life,” Cobarubio says. That person was a friend’s girlfriend. A high school wrestler and football player, and a drummer, Cobarrubio gave up college and music to help support his family when his father got cancer. He had started playing music at 7 and “practiced all the time.” His parents supported his music, even when he wasn’t very good. “I don’t know how my parents put up with it,” Cobarrubio says. Perhaps they knew how much practice it takes to develop proficiency. “They danced swing like you wouldn’t believe,” and often would bring the band home with them when the clubs closed. Everyone would jam till dawn. In that atmosphere, Cobarrubio became good enough that he started getting fill-in work while still a schoolboy. But that’s also how he began getting high – in cars during band breaks. Cobarrubio says he came close three times to making it as a musician, but drugs got in his way. But by the time he was taken away in that ambulance, Cobarrubio had been clean for a week and was determined to stay that way. Early this year, Cobarrubio moved to his own apartment, in Long Beach. He cooks for himself, and often for his neighbors. He has become close to his younger sister and her daughter. Joe Cobarrubio says tacos were his favorite meal as a child, and here' s how his mother made them. With rice and bean to accompany them. Brown a pound of ground beef with chopped onion, and salt and pepper to taste. Fry a dozen corn tortillas, and place them on a tray. Top with the cooked beef and chopped tomatoes. Add shredded jack cheese and shredded lettuce. Meanwhile, melt a chunk of bacon fat in a pan, add cooked pinto beans and cook well. Mash, add a little water and add cheese to taste. For the Spanish rice, cook 1 cup of rice in two cups of water. When the rice is done, add tomato sauce and cook over low heat till the sauce is soaked into the rice. 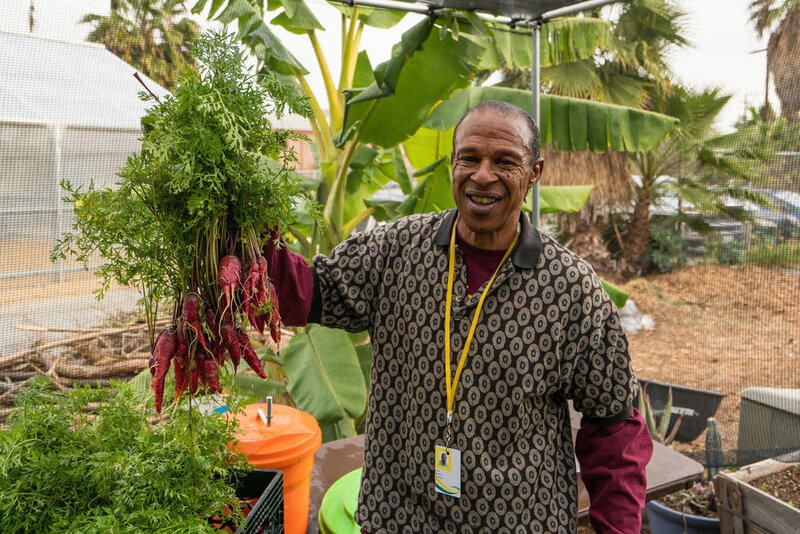 At the Veterans Administration in West Los Angeles, there’s work afoot by the Westside Food Bank to restore at least 15 acres to agriculture – a fraction of the 150 acres that were farmed after World War I, but a start. Community Healing Gardens has put 80 garden beds around Venice, in an effort to bring together a community that seemed indifferent. After school programs, and a partnership with St. Joseph’s have followed. Kiss the Ground also works in Venice, offering young people a 12-week program in growing, including soil, ecology and job placement. And Taking the Reins near Griiffith Park grows food with the girls who take part in its healing programs that use horses as part of their therapy. Food is something they clearly have in common. But they, and several other projects, also were all awarded grants through the office of L.A. County Supervisor Sheila Kuehl. They gathered at the Salvation Army Bell shelter on June 3 to share their efforts and take a tour of GrowGood farm. Molly Rysman had worked at Skid Row Housing Trust. When she joined Kuehl as a deputy, she proposed spending some of the supervisor’s discretionary funds for a program called Food for the Soul. Its aims, Rysman says, are to increase food security, provide a therapeutic environment and break the social isolation that can come with homelessness. “When your hands are in the dirt,” many differences among people dissolve, she says. The 2-year-old Food for the Soul project awards grants of $5,000 to $20,000 to nonprofit organizations in the Third District for programs that engage people who have experienced homelessness, in agriculture, nutrition and cooking to improve food security and community. The Westside Food Bank put in a couple dozen raised beds at the VA as a test project. Since October, the food has gone to about 150 veterans, distributed from a tailgate each week. Often, the veterans who work the land eat the food, said Bruce Rankin, executive director of the Food Bank. The goal is to add more beds and to work with the teaching kitchen on the VA campus, Rankin says. Other organizations receiving grants included Kiss the Ground, Safe Space for Youth, Step Up on Second, the Center at Blessed Sacrament in Hollywood, The People’s Concern and the Teen Project. “We don’t have the most efficient garden. But it’s the most efficient for creating relationships,” says Kelvin Martinez, program facilitator at the Center at Blessed Sacrament in Hollywood. After a meeting in the shelter building, participants walked around GrowGood, led in part by Sharon Pregerson, whose son is one of the farm’s founders. “I just let all my problems go when I’m out here,” Velva told the group. He recently completed the GrowGood transitional employment program and has stayed on as an employee. The meeting ended with lunch, including herbal tea and salad – both made from GrowGood produce.